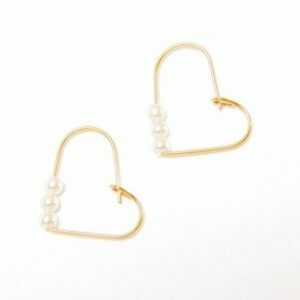 For hypoallergenic earrings, check out these Crystal Loop Earrings: Features a 6mm Swarovski® clear crystal bead dangling on an open loop design made of high-grade surgical steel nd then electroplated in a thick layer of pure 24K gold. Designed exclusively for Sensitively Yours, Inc by Virginia Carlson of Savvy Disco Designs LLC! A classic, delicate look! Each pair comes with a matching set of earring backs (butterfly type) made with the same durable, hypoallergenic materials. The notched post provides a secure fit so you can wear them comfortably in any circumstance without risk of them falling out and being lost. Easy to wear and care for, helping you look your best. Size: 4mm wide x 20mm long (5/32 inch wide x 7/8 inch long). The Sensitively Yours allergy free line of products is made from materials with a great history of success in preventing any allergic reaction to earrings. The surgical steel earrings have been the best solution for metal allergy. Sensitive ears have also been protected through the use of pure gold, to block the reaction caused by nickel allergy. Focused on creating and offering the best in earrings for sensitive ears, we test and select the styles that are both very attractive and optimally safe. Many testimonials over the years are from customers who were allergic to earrings, but now found an answer that truly works. As evidence of our commitment, we off the Lifetime Guarantee Against Reaction.